When Manchester City lifted the English Premier League (EPL) trophy last season, they became the first side in the history to record 100 points in a single league season. Not only this, on their journey towards the pinnacle of the league, they shattered numerous records; most wins (32), consecutive Premier League wins (18), most goals scored in a season (106), most passes in a Premier League game (902), most away wins (16), most away points (50), biggest goal difference (+79), points ahead of second (19). It was a record-breaking season that saw Pep Guardiola’s men winning two out of four possible trophies. To give an insight of this record-breaking season and go behind the scenes to bring the never-seen-before candid scenes from the locker room, team talks, training, and sneak-peeks inside players’ houses, Manchester City entered a £10 million deal with e-commerce giant Amazon to document the record-breaking season. Amazon followed the team everywhere for the entire nine months of the 2017/18 season, capturing the moments through various cameras placed in training grounds, dugouts and locker room. 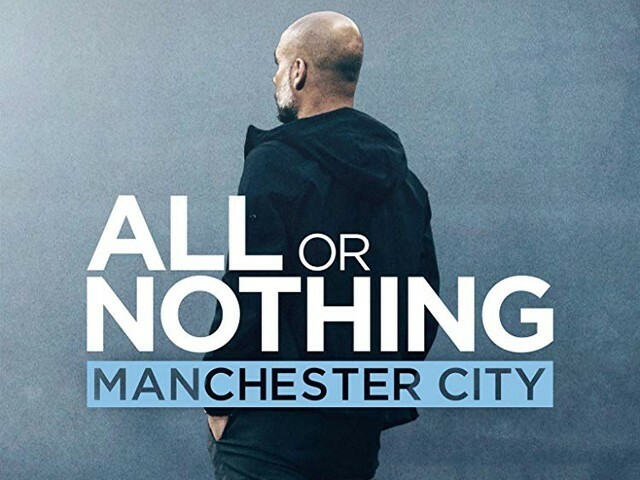 The documentary All or Nothing: Manchester City has been released this month on Amazon Prime. All or Nothing: Manchester City is the latest addition to the award-winning All or Nothing series, which has previously documented the journeys of teams from other sports including National Football League’s (NFL) Arizona Cardinals, the Los Angeles Rams, the Dallas Cowboys, and also New Zealand’s rugby team, All Blacks. The eight episodes bring to light the efforts, pain, injuries, drama and setbacks that were shadowed by the relentless Man City, who appeared at total ease, trouncing almost every opponent, dismantling records and easing their way to the top. What appeared a walk in the park was, in reality, a meticulously crafted endeavour that included intricate planning, arduous schedule and chronic injuries. The kernel of the series is City’s manager Guardiola. In the documentary, impassioned Guardiola can be seen slapping his hands, stomach, chest and forehead to make his point which always comes down to goals, goals and goals. Guardiola’s locker room talks gave an insight on how he kept the players motivated, keeping complacency at bay despite 18 consecutive wins. He can be seen having a whiteboard and ferociously moving magnetic pieces on it to explain the tactics and mark the opponent’s players. He impelled the players with his vigour and occasional curses. He explained to every single player what to do, how to create space and he made sure that his players played exactly the way he wanted and that was shown in a match against Leicester City, when Kevin De Bruyne scored a goal exactly as Guardiola envisaged. Apoplectic Guardiola, goaded by blatant tackles being overseen against his players also got into heated arguments with referees. The documentary depicted the affable environment of the locker room and the relationship that the players had with each other. The team’s backing of individuals amidst the time of pain was great to see. David Silva faced a tormented time when his son Mateo – now fully recovered and also made an appearance as a mascot in City’s game against Huddersfield – was prematurely born and was kept in the hospital for five months. Silva, the most important cog of City’s midfield machine, had to dash between Spain and Manchester. The entire club supported him and Guardiola was seen motivating his player before the game against Tottenham ‘to win it for Silva and his wife’. The friendships also helped players who were compelled to live away from their families like Sergio Aguero, whose son lives in Argentina and visits him once every month. The club’s hegemony including Chairman Khaldoon Al Mubarak, CEO Ferran Soriano, COO Omar Berrada and Director of Football Txiki Begiristain, got the due mention in the documentary for providing the players Guardiola wanted in his squad. The documentary also carries some lighter moments like Vincent Kompany watching Manchester United lose against West Brom (United’s loss confirmed City as winners) with his father-in-law who was a United fan. There was banter between players like one in which Oleksandr Zinchenko had to bark after losing a bet to Sterling. The chairman, Mubarak, mentioned that the club’s owner, Sheikh Mansoor, gave him the news of City’s win over the phone, as he was on a flight and had totally forgotten about Manchester United playing West Brom. City’s record-breaking mirabilis eclipsed the detriment it caused to players. At one point, Gabriel Jesus, Benjamin Mendy, John Stones, Kompany, Zinchenko, Phil Foden and Leroy Sane were all injured. City was participating in four competitions simultaneously and was battling too many injuries. But City’s medical staff helped the players to recover from their injuries. They won the award for the Best Medical Professional in the Field of Football for that year. Man City has always remained under the shadow of their juggernaut rivals Manchester United. For fans, the elation of seeing their team being bereft of accolades for so long and then clinching three titles in a decade was really a sight to behold. Fans have only imagined the Blues to be this belligerent, and to see their team perform the way they did was an exhilarating experience. The documentary captured the catharsis of Manchester City fans, who have been following this club for ages. As a Cityzen (a term for fans of Manchester City), All or Nothing freshened the memory of 2017/18 season. Going behind the apparent façade, the scenes from the locker room, delving into players’ lives, the mastery of Guardiola, the environment, the enthusiasm, it all just gave a new dimension to the record-breaking season. If there has to be one taking from this documentary, it ascertained what a tactical genius Guardiola is.